Sigh, October. It’s my favorite month and it contains all sort of fun events and celebrations, but it’s always so busy! Because my birthday fell on a Saturday this year, I decided we needed to go away for the weekend to celebrate both our birthdays (Mark’s is just a few days after mine). Mark wanted to go to the Blue Ridge mountains, but because the fall colors are so spectacular there, everything in that area books like a year in advance. 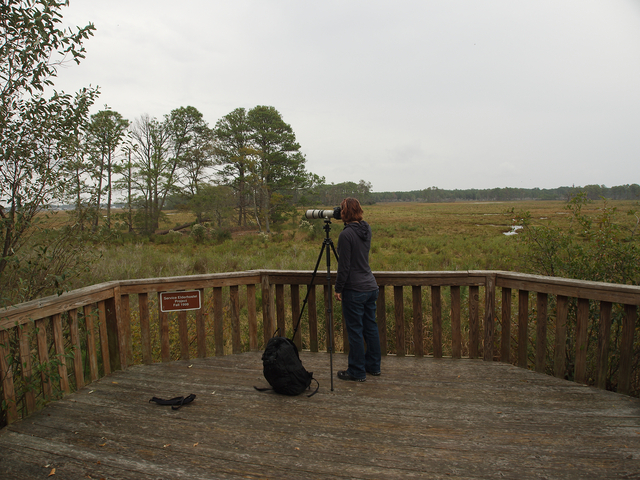 I’ve been wanting to go to Chincoteague National Wildlife Refuge for a while, so we booked a B&B on Chincoteague Island. There was a while there during the furlough when I thought the weekend was going to be ruined (as all national parks and refuges were closed), but fortunately the government reopened the day before we were scheduled to leave. Chincoteague Island and NWR are located just south of the Maryland/Virginia border; in fact, although we live in Virginia, most of our drive was in Maryland. 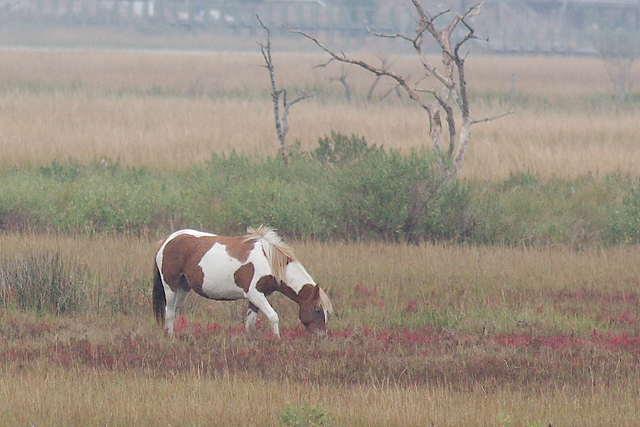 Although like many people from the Baltimore area I spent lots of adolescent summers in Maryland’s Ocean City and Delaware’s Rehobeth Beach, I’d never made it to nearby Assateague Island or Chincoteague right below it, each home to a herd of wild ponies. When I started getting into wildlife photography, however, it became a required destination. 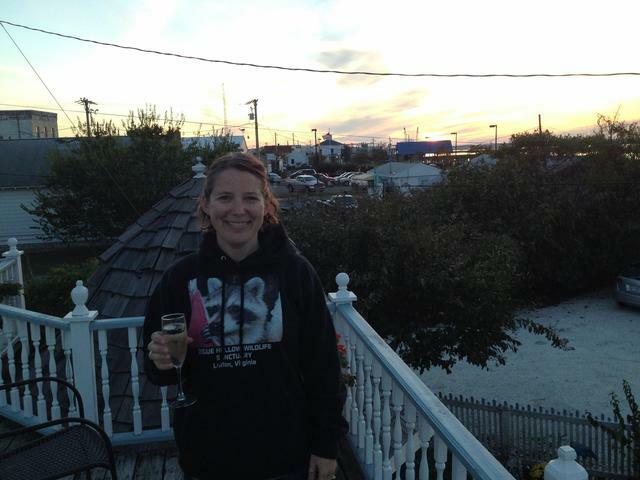 We stayed at Miss Molly’s Inn, famed location where Misty of Chincoteague was written. Miss Molly’s is charming, the host, Sam, was funny and very friendly (I barely saw his wife), and they were happy to accommodate our vegan diets. The entire island is small enough that you can pretty much walk the whole thing, but the inn is conveniently located on the main road with most of the shops and restaurants. We stayed in the room off the upper deck. 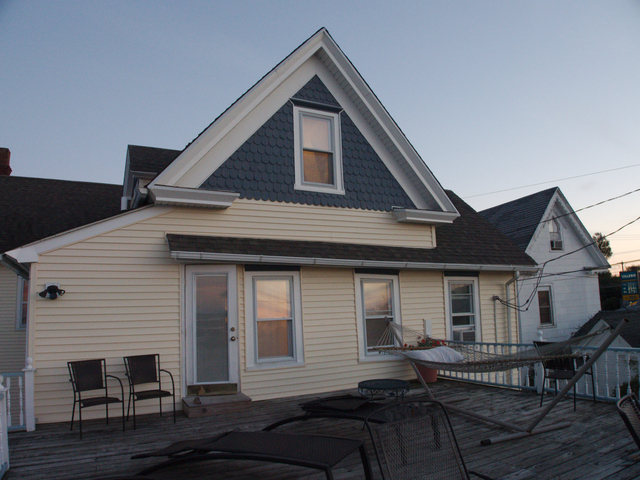 The room itself was kind of tiny, but check out our awesome deck! 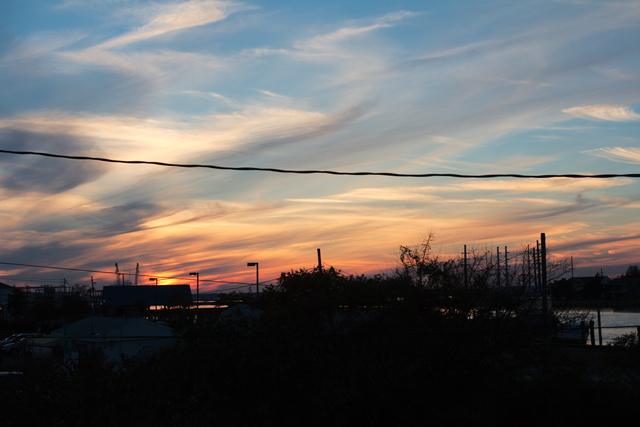 …watching the sunset from the deck. Lovely! 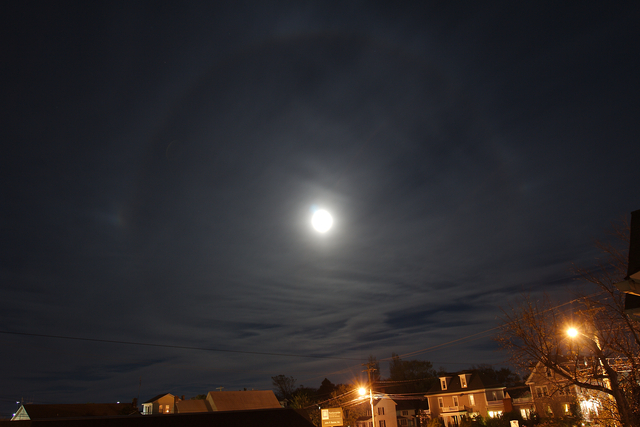 There was a harvest moon that first evening, and once it got dark enough, I noticed an arc of light circling it, with two rainbow patches to the left and right of it. I’ve seen that happen with the sun before and knew it was called sun dogs, and though I don’t recall seeing such a thing around the moon, I decided what we were seeing were moon dogs. Turns out I was right: moon dogs exist. It’s kind of hard to discern from the picture – it’s somewhat difficult to photograph without burning out the moon – but it was really neat in reality. 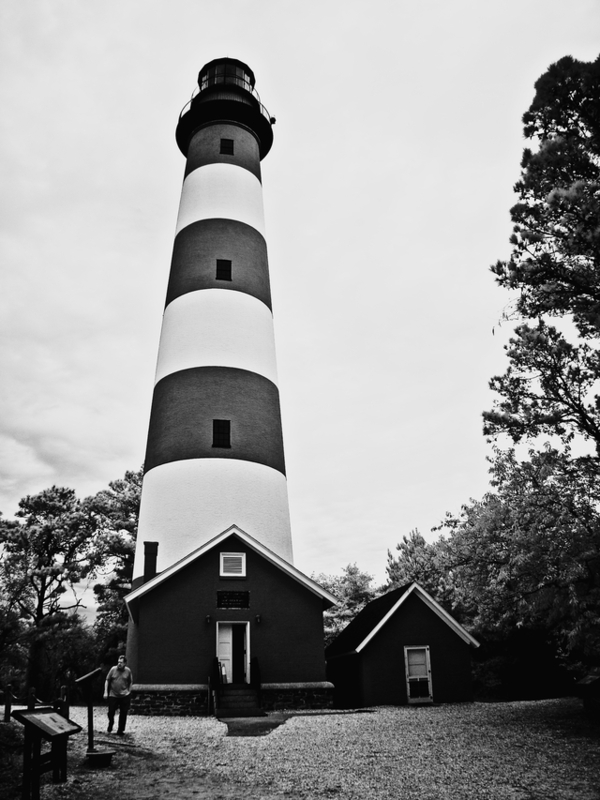 Chincoteague is not much of a hot vegan destination, although you won’t starve there. It’s mostly seafood, though all the seafood places serve pasta. I sort of hate getting pasta marinara out, though, because it’s something I can make deliciously at home in my sleep. There is a single Vietnamese (the only Asian place, I believe) restaurant on the island, Saigon Village, but fortunately it was two blocks from Miss Molly’s and had plenty of vegan-friendly options. We ate outside on the porch which was nicer than the brightly lit interior, although it was getting a bit nippy, and we soon regretted not just getting take-out and eating on our deck with some wine. Nonetheless, it was a good meal. Mark ordered a spicy noodle dish with tofu. The waitress asked him how hot he wanted it on a scale of 10 out of 10 and tried warning him against it when he said “10”. However, she gave in when he said he grows and eats raw ghost peppers. Mark was subsequently suitably impressed with the spiciness of the noodles. In fact, it took him longer to eat his food than it did me mine, and that’s UNHEARD of because I’m a notoriously slow eater and he’s really fast. 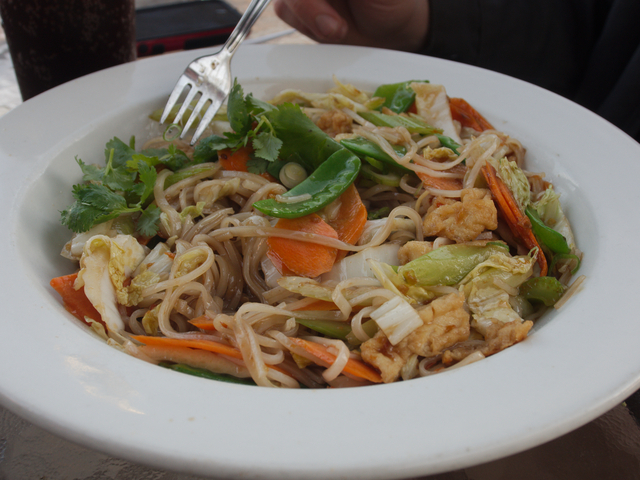 However, the noodles weren’t so hot that they had no flavor and I was quite happy to eat more than a few forkfuls. 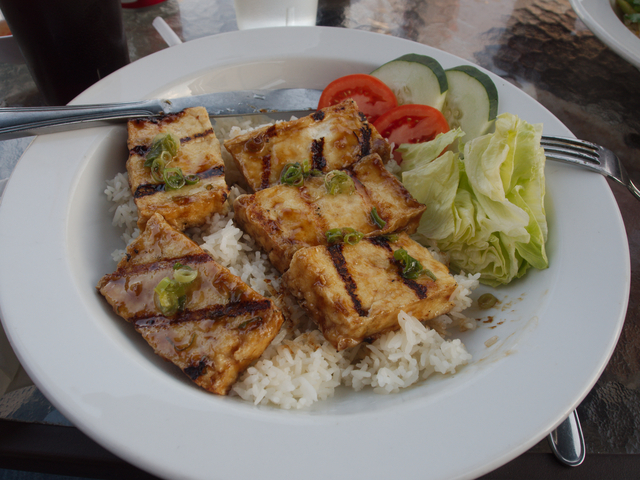 I ordered barbecued tofu, which was pretty yummy. Loved the grill marks. And that’s all the food pictures I remembered to take! (And Mark had to remind me to take those!) The other night we ordered pizza delivery. The pizza from Famous Pizza wasn’t the most amazing pizza I’ve ever had in my life, but they were very friendly, didn’t sound at all surprised I didn’t want cheese, and it arrived a few minutes before they said it would, even on a Saturday night. 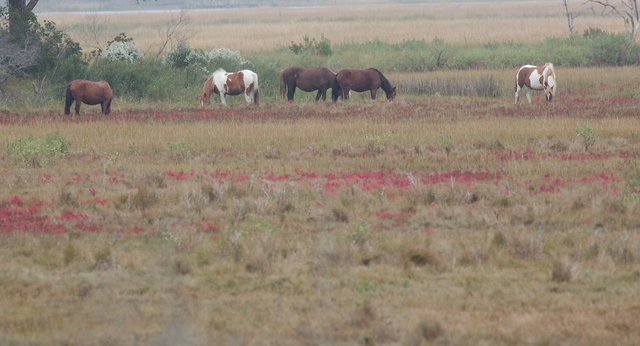 Saturday morning we headed out to the wildlife refuge and were rewarded with ponies! 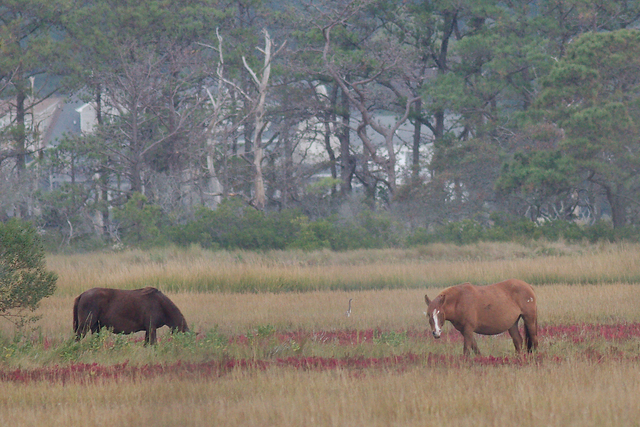 They were pretty far away – hard to see without my 400mm lens – and it was misting most of the morning, so my pictures aren’t super sharp, but wild horses are exciting nonetheless. 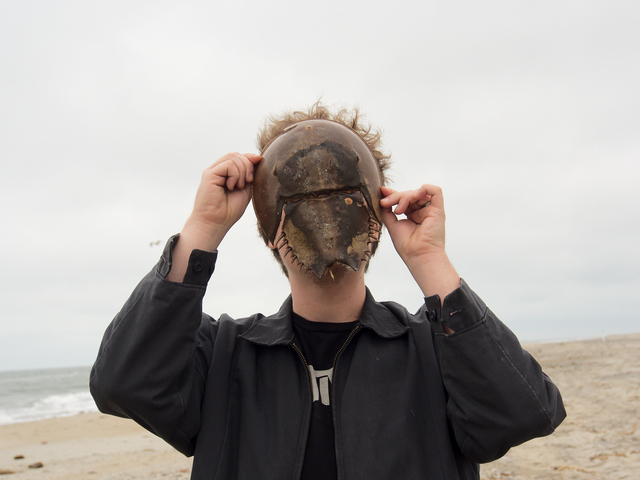 Wanna know what I look like when I’m photographing wildlife? … and climbed to the top. 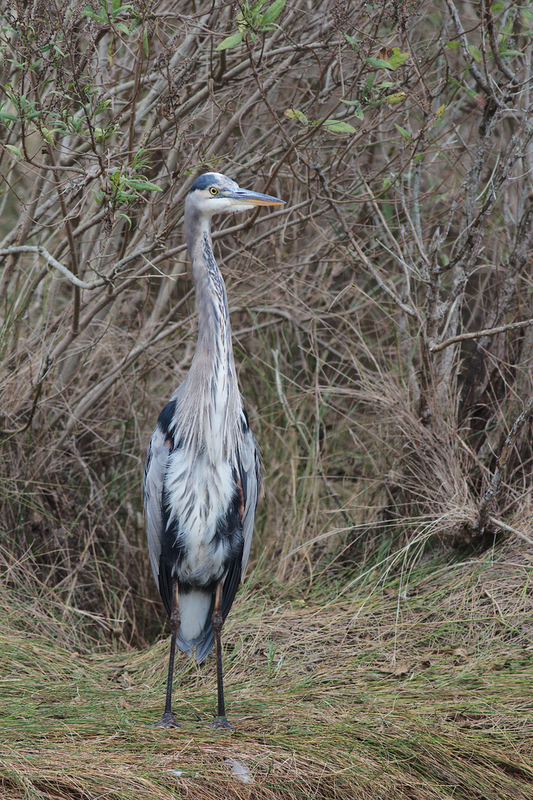 I almost didn’t recognize this great blue heron when I first saw him, until he turned his head slightly. 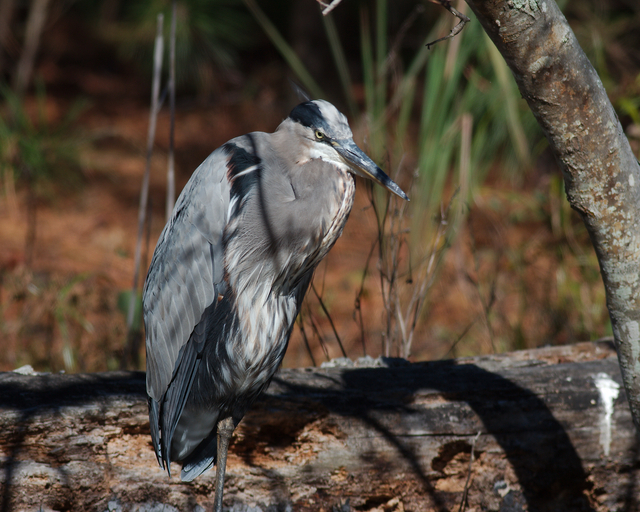 Until then he was almost 2-dimensional – herons look a bit weird straight-on! 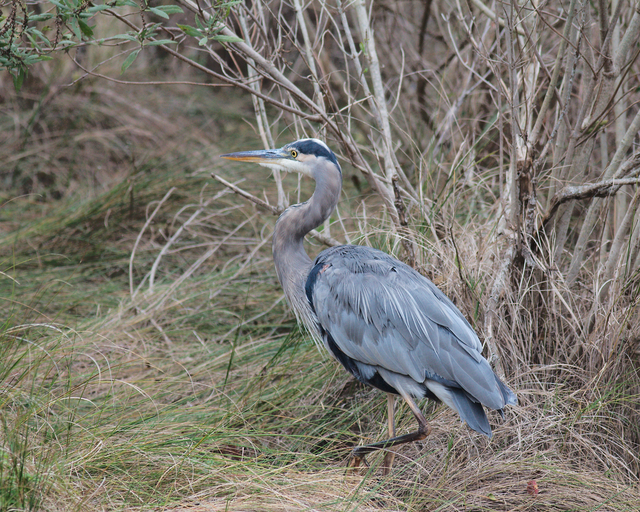 We saw a LOT of great blue herons. 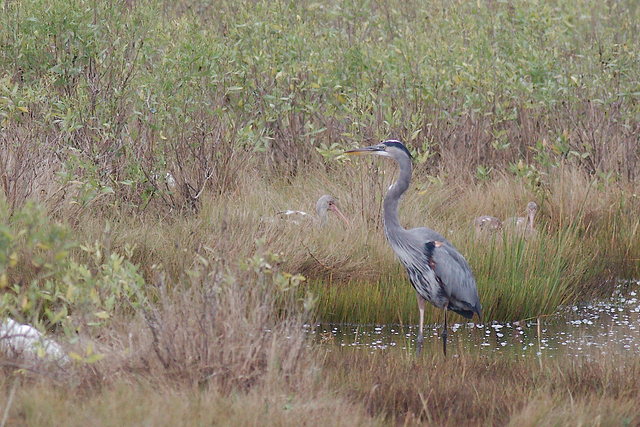 If you look closely in this picture, you can just barely make out a bunch of birds OTHER than the heron, hiding! 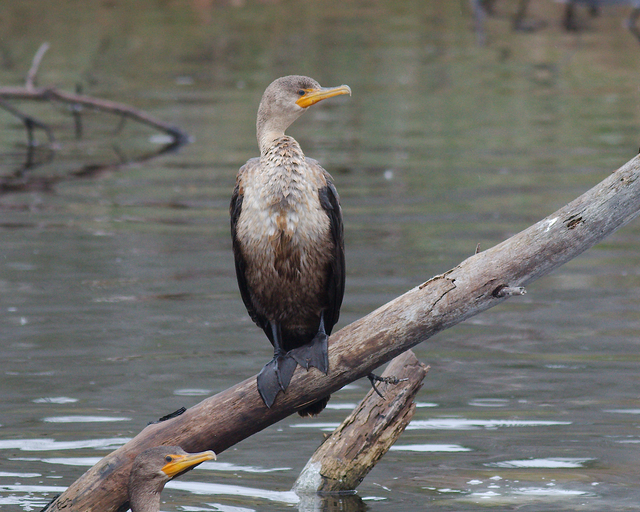 I believe this is an immature double crested cormorant. They are funny. They reminded me of something out of Disney when posed like this for some reason. 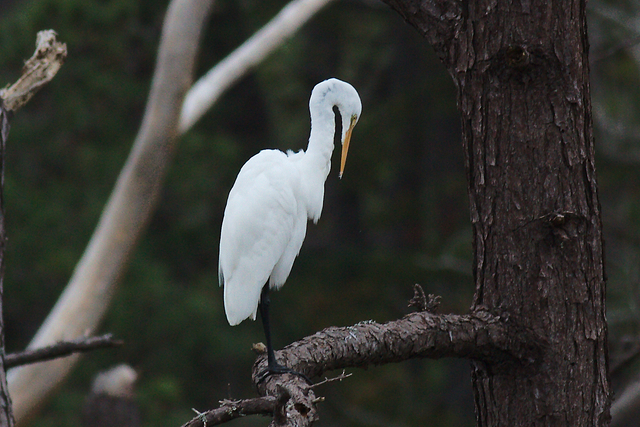 Great egrets are a big thing in Chincoteague, after the ponies. 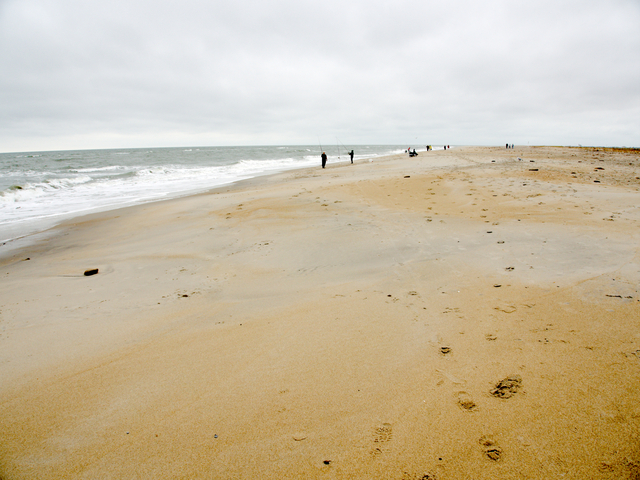 Assateague National Seashore is part of Chincoteague NWR. Mark was sad that due to weather conditions he was unable to get an on-sand permit for his Jeep. But not so sad he couldn’t delight in the treasures he found. 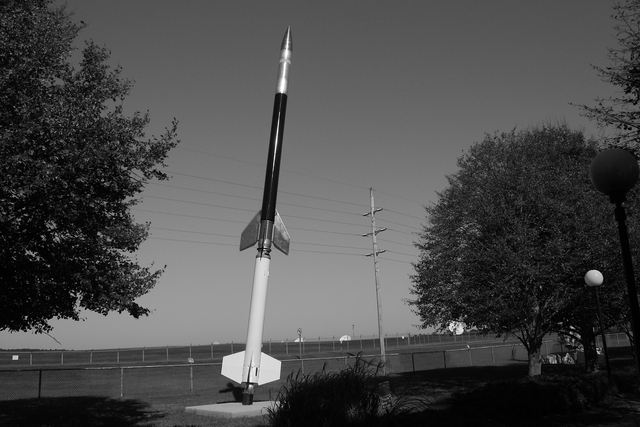 Sunday we visited NASA’s Wallops facility. 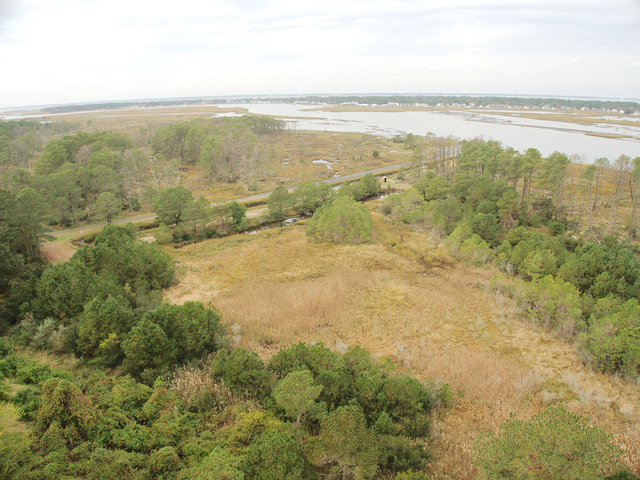 We also stopped by Blackwater NWR, which was just a few miles out of our way. 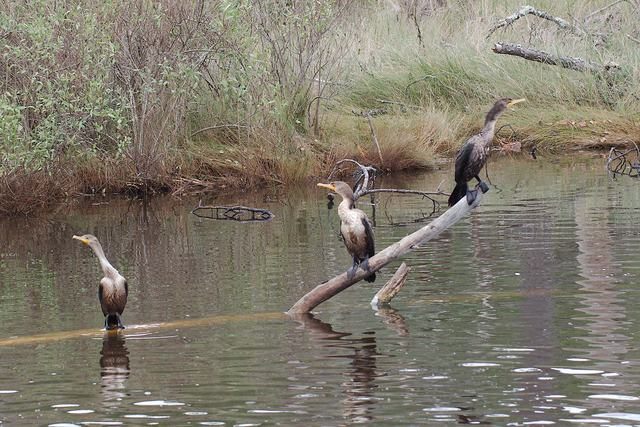 Lots more herons! How mean does this one look? All in all, it was a very lovely weekend! And now…Halloween party time. So there’s a lot of frustration here. Philosophically, I am very angry. Disgusted with our Congress. My government has given me plenty of reasons not to trust them, but I think taking my job and salary from me takes the cake. How can I have any faith or trust in them? They clearly do not have the well-being of myself or any other citizen in mind. It’s funny; they’ve taken away the two places I spend the most time: my job and the wildlife refuge (no sense linking to it because the website currently redirects to the Dept. of the Interior (even their WEBSITE is shut down!). Remember how in my last post I mentioned the sign in the refuge that says “Welcome to YOUR National Wildlife Refuge”. Well, apparently it’s NOT mine: it’s the “government’s”. Okay, I’m starting to get worked up. Next thing you know I’ll be blasting Rage Against the Machine and pumping my fist in the air. I AM outraged, but I don’t want you to think I’ve been sitting around feeling sorry for myself, because I’ve barely had time to do any sitting! I’ve been putting in some extra time with both the raccoons and the raptors, and I’ve been spending time with my brother (also furloughed) and a good friend, and I’ve been taking care of a stray cat, and I’ve been canning up a storm, and I’ve been discovering new music, and basically being furloughed is EXHAUSTING! And I haven’t even had time to do half of the things I want to do. I feel more harried at times than I did when I was working! I have no idea how that’s even possible. A lot of recipes on the internet specify russet potatoes, but I used less starchy red potatoes. 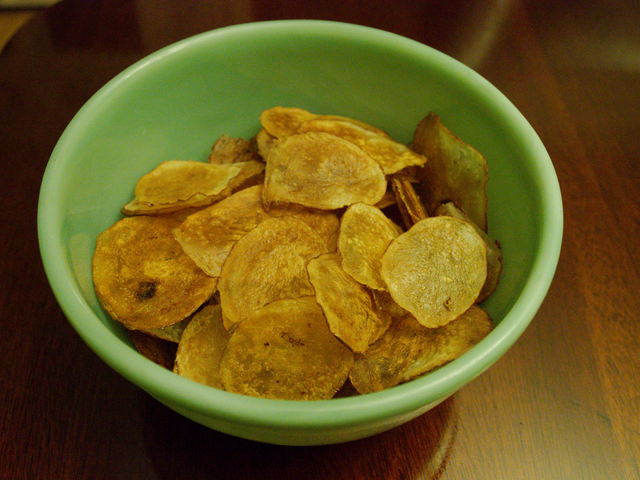 You should really use a mandoline to slice the chips, but paper thin is really too thin. 1/16″ or so is a little better. Peanut oil is traditional, but olive oil works fine. These go from not done to overdone FAST. Check the chips pretty much constantly and remove those that are done immediately, then return the pan back to the oven to finish up the others. As the chips finish, I like to remove them in a single layer to my wooden chopping block. They cool very quickly there without building up any condensation. Within a couple of minutes, I can move them to a bowl where they stay crisp. You can try blotting off the oil with a paper towel, but the chips are fragile, so it’s easier to try to keep the oil to a minimum in the first place. I was going for salt & vinegar flavor, but found that I couldn’t really taste the vinegar if I drizzled it on before cooking. Instead I salted them before baking, but just spritzed with a little malt vinegar right before serving. Preheat the oven to 400 degrees Fahrenheit. 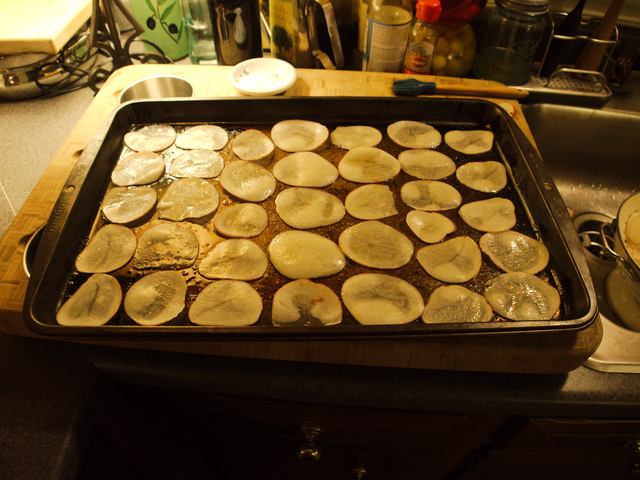 Use a mandoline to thinly and evenly slice the potatoes about 1/16″ thick. If you have time, soak the sliced potatoes in cold water for a while to remove some of the starch, then drain them well. Brush a thin film of oil on a large baking pan and arrange the chips in a single layer, then brush a little oil over them. Sprinkle lightly with salt. Bake just until golden brown. They will in all likelihood not finish at the same time; remove them with a thin spatula as they finish. Let cool in a single layer. 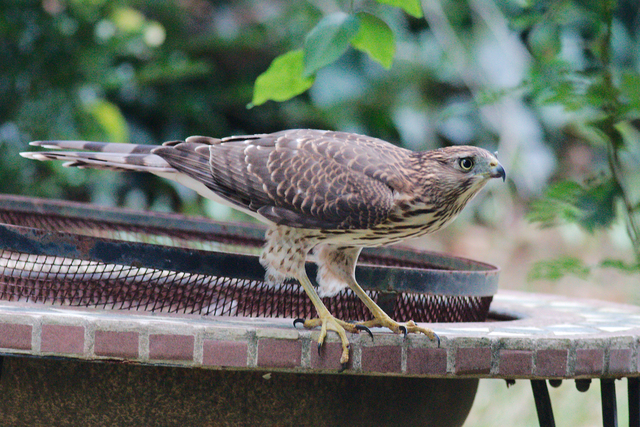 I’m not yet able to share any pictures from the raptor rehabbing I’m getting involved with, but I can talk about a raptor visitor we had in our yard. 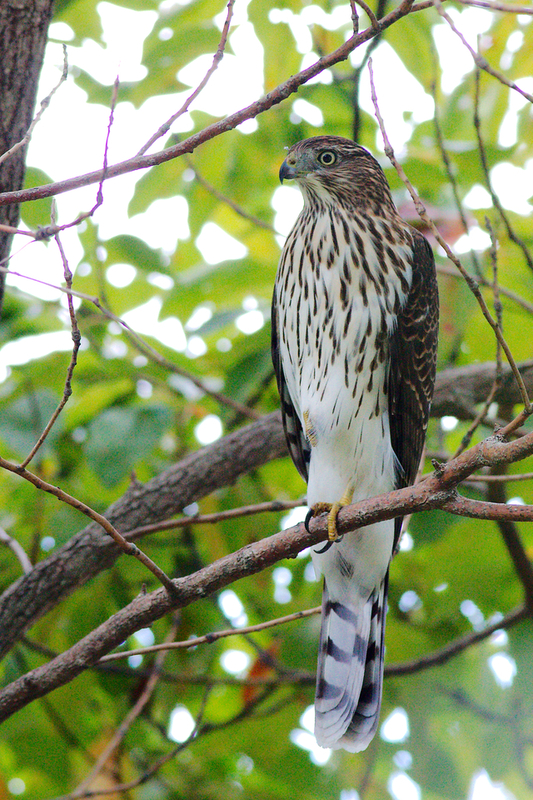 I showed you a Cooper’s hawk that was patrolling our bird feeder back in March. 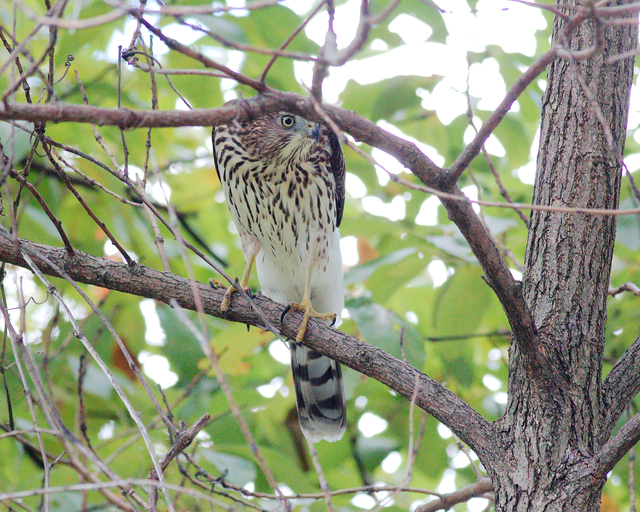 Well, we had another one here last week, this time a juvenile. 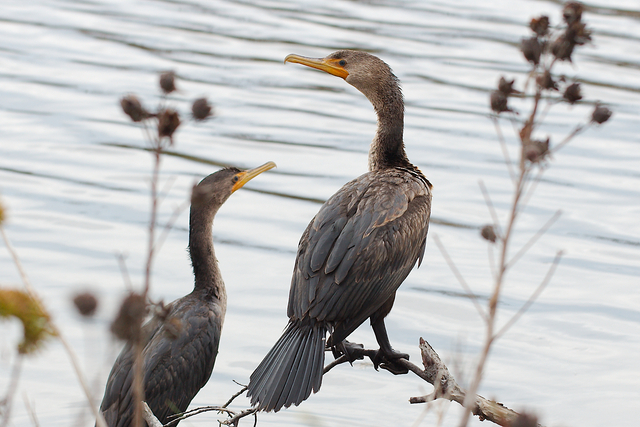 If you look back at the older post, compare the difference in coloring between the adult and the juvie. I have mixed feelings about him. On one hand, HE’S TRYING TO EAT MY BIRDS, which I just think is rude. 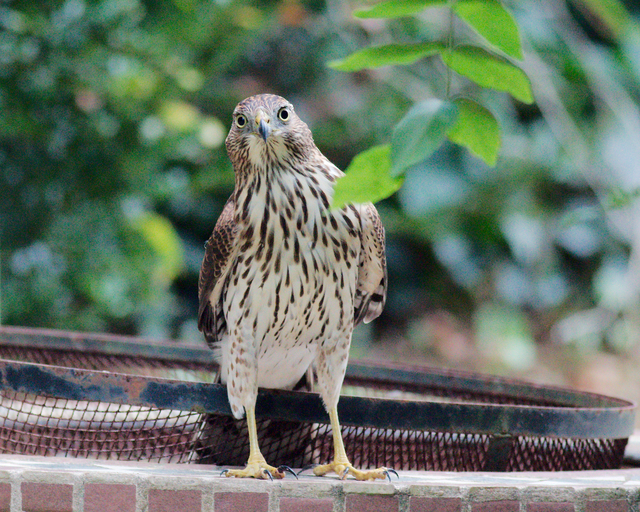 On the other hand, that’s what hawks do: they eat smaller birds. It’s his prerogative. And also he’s beautiful! Look at him hunting down my songbirds! Damn him! Look at him looking at ME! ISN’T HE AWESOME? Seriously, how can I be mad at that face? I love raptors; can’t help it!